The annual international Black Ribbon Day commemoration for Manitoba was held in Winnipeg at Holy Eucharist Ukrainian Catholic parish church in East Kildonan. The event is organized by various local communities that represent mainly Eastern European nations. The idea is to remember anniversary of the tragic Molotov- Ribbentrop pact that ushered in a horrific period of totalitarian governments that oversaw the slaughter of millions of victims throughout Europe. The movement’s website explains that the Day, “historically commemorates the anniversary of the infamous Molotov- Ribbentrop pact, a sinister partnership treaty between Nazi Germany and Soviet Russia that allowed each to violently and illegally seize the lands and peoples situated between them and in essence started the second world war. 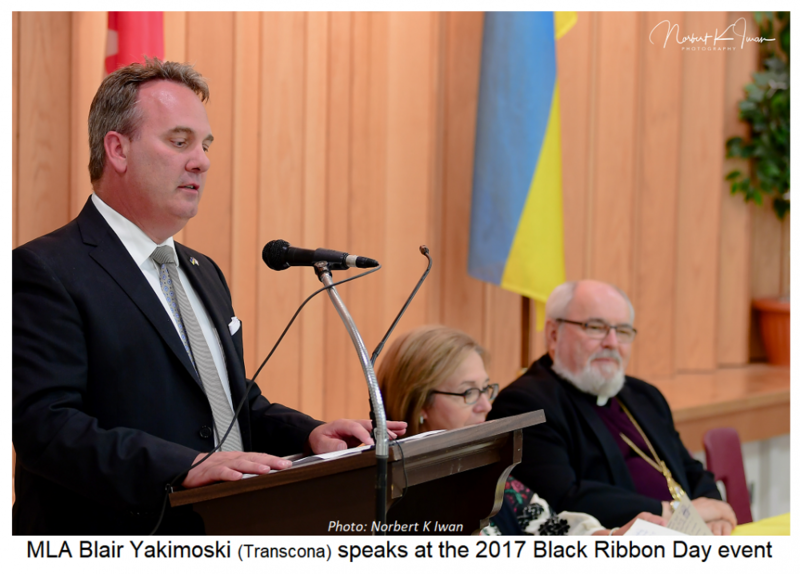 Twenty Five years ago, Canada’s Central and Eastern European communities, by initiating Black Ribbon Day, were instrumental in bringing international attention and understanding of the plight of their heritage nations. This Canadian initiative organized demonstrations in 21 cities on both sides of the Iron Curtain. In 1989 close to 2 million people formed a human chain across the Baltic republics and by 1991, demonstrations were held in 56 cities on three continents. Presently, August 23rd is officially commemorated in close to a dozen European nations under several names including Black ribbon Day and European Day of Remembrance for Victims of Stalinism and Nazism.” Local activist and writer Peter Monastyrsky wrote an article in UkrainianWinnipeg that expresses well the sentiments of many of those who participated. The evening in Winnipeg, organized by the Manitoba Branch of the Ukrainian Canadian Congress (KYK) under the direction of Mrs. Myroslava Pidhirna, began with a panakhyda (requiem) service in Winnipeg’s breathtaking Holy Eucharist Ukrainian Catholic Church at 505 Watt Street. The Ukrainian Catholic Metropolitan-Archbishop of Canada, His Grace Lawrence Huculak led the prayer ceremony and spoke a few words of introduction of the event to the people gathered. He explained that the Ukrainian Orthodox Metropolitan of Canada, His Eminence Yuriy Kalistchuk planned to attend, but was called away to an important matter. Two prominent members from the Orthodox Church in Canada were able to attend – the Chancellor of the UOCC and Chair of the Presidium, Archpriest Fr. Taras Udod and the Dean of Theology of St. Andrew’s College, Archpriest Fr. Roman Bozyk. Clergy from the Ukrainian Catholic Archeparchy of Winnipeg included: Chancellor, Fr. Michael Kwiatkowski, Fr. Djura Maljik and Fr. Deacon Leon Twerdun. 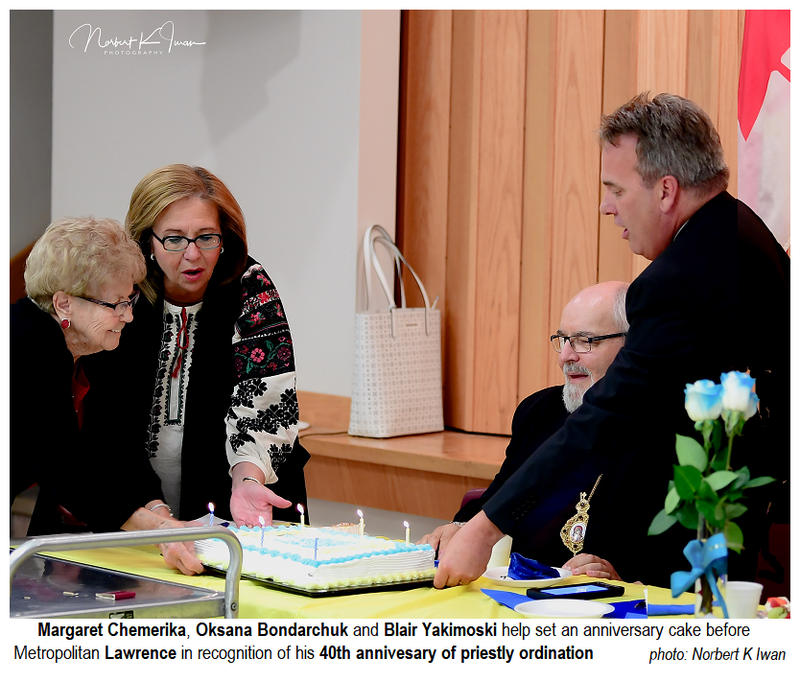 The parish branch of the Ukrainian Catholic Women’s League of Canada prepared an special buffet of food and drink in the church auditorium. After everyone had the opportunity to chose some refreshments and take a seat, Mrs. Margaret Chemerika. the Branch president of the UCWLC, took the Metropolitan by surprise as she brought in a beautifully decorated cake to commemorate Metropolitan Lawrence’s 40th anniversary of priestly ordination that he would be celebrating in few days. After a lively singing of “Mnohaya Lita!” the program got underway. The President of the Manitoba Provincial Council of the Ukrainian Canadian Congress, Mrs. Oksana Bondarchuk gave an excellent presentation on the significance of Black Ribbon Day and why it is so important that the annual commemoration continues. Two members of the Manitoba’s Legislative Assembly, Mr. Nic Curry of Kildonan and Mr. Blair Yakomoski of Transcona both spoke to the event and added personal stories about their families and friends. Metropolitan Lawrence again spoke briefly as did the Chair of Holy Eucharist Pastoral Council, Mr. John Petryshyn. Other dignitaries were present, including the President of the Manitoba Provincial Council of Canadian Polish Congress (KPK), Mrs. Grazyna Galezowski, as well a representative of the Provincial Council of the Sisters Servants of Mary Immaculate, Sr. Jean Zemliak together with other Sisters.